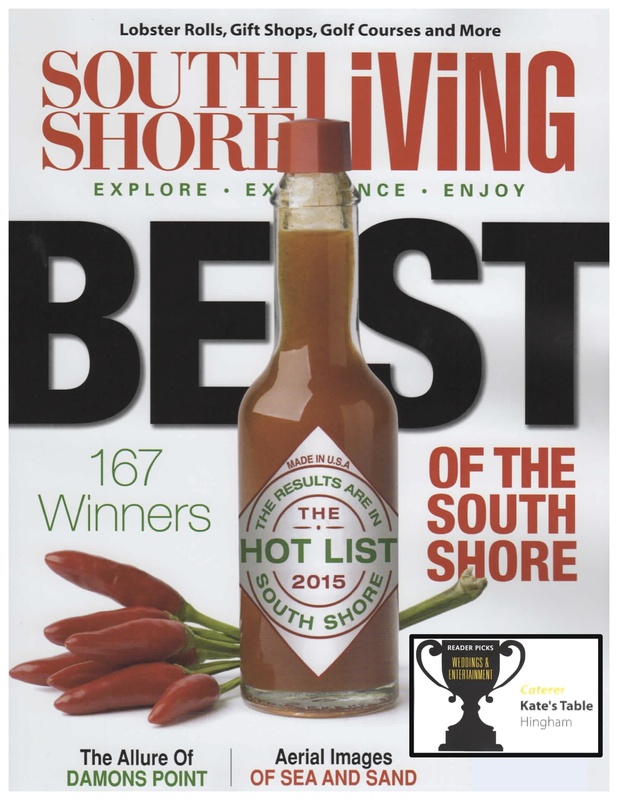 Kate’s Table was named “Best Caterer” by South Shore Living Magazine. 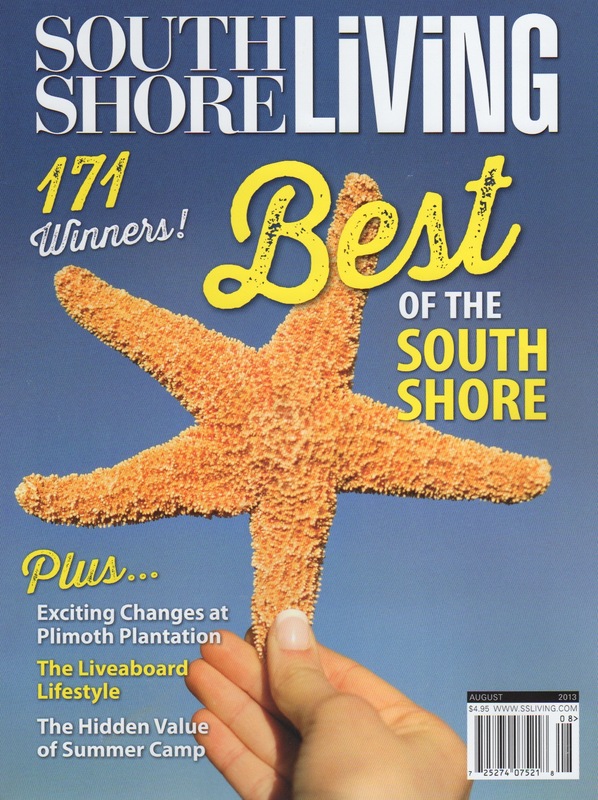 This just hit newsstands today! 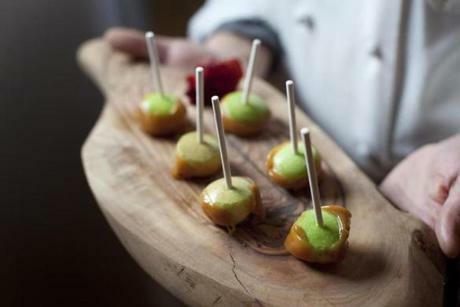 For a catered party in Cohasset, Kate’s Table prepared micro caramel apples. COHASSET — Caterer Kate Papaleoni and her assistant are arranging platters of gin and tonic Jell-O shots, showering chives over a plate of dumplings, and lining up homemade chocolate-dipped marshmallows in a bed of crushed graham crackers in the basement-level kitchen of a private home here. Upstairs, lights are twinkling and hosts Andrea and Craig Hillier are getting ready for 60 guests to arrive for the holiday bash they throw every few years. Andrea Hillier, 48, says she started planning for the event in early October, when she set a date, called Papaleoni’s catering company, Kate’s Table, and sent out invitations to the couple’s friends. 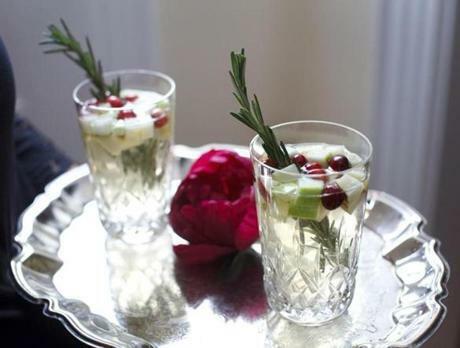 Whether you call a caterer or plan a DIY affair, for many hosts a holiday celebration can bring as much stress as it does joy. From creating a perfect playlist, to getting the menu and the lighting right, throwing an amazing party is all in the details. It might take a few occasions of doing it wrong to host a memorable soiree without making yourself insane. But a checklist is nothing without a budget. You have to decide what part of the party will have the most impact (on your guests as well as your wallet). For Hillier, hiring Kate’s Table was key. “I wanted everyone to say ‘wow’ about the food,” she says. Since Hillier knew the catering would be the biggest part of her budget, she scaled back on decor. Kate’s Table made “Hillier Holiday Sangria” with pinot grigio, white grape juice, sparkling water, apples, cranberries, and rosemary. Hillier’s menu featured lobster and corn fritters served with basil aioli, Baja fish tacos (with a mini margarita on the side), shots of carrot soup with spiced pumpkin seeds, and tiny panini filled with robiola cheese, escarole, and fig jam. When you’re working with a caterer, aim for lots of variety in the passed appetizers, says Kate’s Table co-owner, Papaleoni’s sister, Kelly Griffin. “You want your guests to get lots of little tastes of everything that’s coming out of the kitchen.” Griffin recommends planning for six to nine bites per person for a cocktail party (closer to 10 if no dinner is being served), and choosing up to 12 to 15 different nibbles to keep things exciting. Catering may not be a priority, but this is not the time to test out a new recipe. Bring out the star players in your cooking repertoire, or better yet, get your guests involved. “We throw a lot of interactive parties at home,” says State Park and Hungry Mother co-owner Rachel Munzer. Having guests make their own tacos or doing something like fondue “gets people talking more and gets them engaged,” she says. “It lightens the mood.” And whatever you do, make enough so you won’t run out. “I always overprepare,” says Munzer. At a recent State Park party to celebrate Pretty Things Beer and Ale Project’s sixth birthday, Munzer and her staff laid out a spread that included a roving cart of chicken wings and bratwurst, and instead of a birthday cake, there was a slightly off-kilter croquembouche, the tower of cream puffs made in French pastry shops, held in place with caramel. There’s a solution to avoiding expensive flower arrangements, says Katrina Jayazeri of Bread + Salt Hospitality, a pop-up restaurant currently running at Wink & Nod in Boston’s South End. Use cheaper things in quantity. Pile tangerines or clementines, vintage ornaments, or ribbon candy in glass bowls, or collect twigs from the yard, spray paint them white or silver, and arrange them in a tall vase, she suggests. Your menu can also evoke simple abundance, says Jayazeri. Fish baked with lemon and herbs can be served whole on a platter and garnished with sliced citrus; oysters Rockefeller are perfect special-occasion food that can be assembled in advance and are self-contained in the shell. Finish with a beautiful cheese plate and an overflowing bowl of fruit with bowls of whipped cream for dipping, and “you can make it look opulent,” she says. Lighting is sometimes an overlooked party detail, but an easy one to get right. Use lots of candles, says Griffin. “Nothing beats candlelight for a holiday party.” Dim the overheads and put candles everywhere — in front of mirrors, on silver or mirrored platters, in unlikely corners. Votives are inexpensive, as are tea lights, and you can use juice glasses to hold them. Think about a mixture of levels of light, from a wash of uplighting on a wall to a tangle of battery-operated twinkle lights in a bowl. Jayazeri also suggests turning on the music early, simmering some spices on the stovetop to make the house smell festive, and greeting guests with a drink. “It’s those little touches that make people feel comfortable,” she says. Along with a calm host, of course. For a catered party in Cohasset, Kate’s Table prepared marshmallows dipped in chocolate on a bed of graham cracker crumbs. Kate’s Table also prepared micro cones with peppermint chip ice cream. “Lighting is sometimes an overlooked party detail, but an easy one to get right. Use lots of candles. Nothing beats candlelight for a holiday party.” Kelly GriffIn, co-owner of Kate’s Table. The blustery weather becomes an afterthought once you walk into Kate’s Table in Hingham Square. Sisters Kate Driscoll Papaleoni and Kelly Driscoll Griffin opened this cozy takeout shop last September, with fresh sandwiches, salads, soups, and prepared meals with many local ingredients. They transformed a space in the rear of a building that was once a hardware store, painted the walls bright white, made the small store with exposed pipes look hip, and added three tables. Both women are food industry veterans. Driscoll Papaleoni was a chef at the former Icarus and Truc restaurants, and B&G Oysters. Driscoll Griffin has years of experience in event planning and catering. A veggie wrap has roasted zucchini, tomatoes, and portobellos with a creamy artichoke, spinach, and goat cheese spread. Black rice salad is tossed with roasted butternut, pomegranate seeds, and pistachios. Chicken soup is loaded with meat, rich with sherry, carrots, and handmade dumplings. Entrees include pork tenderloin stuffed with port-soaked figs and Gorgonzola, and grilled salmon with soy and ginger. Plenty of sweets like crispy chocolate chip cookies. “Customers say our shop feels like it’s in New York or LA,” says Driscoll Papaleoni. 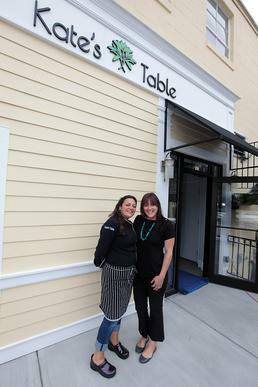 Kate’s Table, 99 South St., Hingham Square, 781-740-4111, www.katestable.com. which will open by September 14. You can find catering service, prepared foods, and smoothies at Kate’s Table. Kate has been cooking professionally for 17 years. Kate Driscoll Papaleoni has been running a private catering business from her Hingham home for the past few years. Now the Hingham mother will move her kitchen to Hingham Square with her sister Kelly Driscoll Griffin, of Scituate. Papaleoni said the new catering business will open sometime in August in the space which was formerly Joseph’s Hardware at the Sherwin Williams plaza on South Street. The new Hingham kitchen will not only offer private catering services for events ranging from weddings to graduations to small intimate dinner parties, but it will also have a take-out dining area. In addition, Kate’s Table will have a cold case full of prepared foods, salads, veggies and sweets, and a retail section made of a variety of dry goods, oils and salts. Papeleoni, who has 17 years of professional cooking experience, said her company will also offer delivery services to companies and South Shore homes. Her sister Kelly will co-own the business and will serve as the event manager. The Driscoll sisters grew up in the town of Lincoln, but now call the South Shore their home. A sampling of Kate’s Table’s menu can be found on their website: www.katestable.com. Joseph’s Hardware closed at 99 South Street in Hingham in 2009. The building has been vacant ever since. Construction is currently being done to the property on South Street. Kevin Shain swears by his ingredients. “Simple recipes made with high-quality ingredients make all the difference,” he said. Though they’re known for their cupcakes, they’ll be featuring their chocolate tarts with a shortbread crust — a new recipe that was well received at farmers markets last summer — at the James Library and Center for the Arts in Norwell on Feb. 8. Ob La Da is one of eight vendors that will help the James usher in February with sweets and aperitifs at a Valentine’s dessert tasting. The benefit features confections from boutique establishments across the South Shore, while raising funds to restore the 1874 Italianate Victorian structure. “It’s a fun way — a delicious way — to support a great cause,” said library director Caroline Chapin. Guests are invited to mingle on all three floors of the “very charming” building, which Chapin compared to a layer cake. With an art gallery on the bottom floor, a library on the middle floor, and a concert hall on the top floor, “the idea is for people to be able to wander the floors,” among fine books, original art, and festive décor, partaking in the “generous sampling of desserts,” paired with Italian wines from Marsh’s Wine and Spirits. Chapin said this will be the first big event for the newly restored concert hall, where bassist Chris Rathbun and pianist John Kramer, two faculty members at the South Shore Conservatory, will perform. Old-fashioned library cards (the kind you print your name on and keep in the slot in the book) will lead guests around the building’s many nooks, where they can check off items that they have found throughout the evening. Once the cards are filled out, they’ll be collected for a drawing for the door prize, a magnum of prosecco. And on that evening, the James will also be a gingerbread house, thanks to a replica produced by Ginger Betty’s Bakery of Quincy. Baked will bring an assortment of mini cupcakes dressed up for Valentine’s Day: signature chocolate, vanilla bean, and red velvet cupcakes topped with a variety of cream cheese frostings (except for the Boston cream pie, which is dipped in chocolate ganache). There’s also the Rasputin — the top finisher in South Shore Living’s Cupcake Battle — a chocolate cupcake filled with homemade bittersweet chocolate pudding and raspberry jam, topped with pink variegated frosting, Belgian chocolate pearls, and a fresh raspberry filled with ganache. “We never bake more than a dozen at a time, and all in our itty-bitty kitchen,” said manager Ann-Marie Robicheau. And what’s Valentine’s Day without chocolate? Taza Chocolate, a bean-to-bar chocolate factory in Somerville, roasts and stone-grinds whole cacao beans in a traditional Mexican style for a “rustic texture and intense flavor,” said marketing associate Kate Hollis. Taza will feature chocolate discs in flavors from Guajilo chili to vanilla to salt and pepper (chosen because they’re best with wine), as well as 80 and 87 percent stone-ground dark chocolate bars. “There aren’t many other chocolate factories like this,” Hollis said. Besides sweets and treats, “local” seems another theme for the evening. Kate Driscoll, chef and owner at Kate’s Table, a catering and event company, said she does all the “fresh picking” herself at local produce distributors and farm stands. She will feature a trio of mini donut holes, including customer favorites such as apple cider rolled in cinnamon sugar and raspberry filled with lemon curd and topped with lemon icing, as well as showcasing for the first time a light glazed donut hole filled with Nutella. “These will all be going out warm,” she said. Tara Hollander, owner of Doorknock Dinner, a dinner-service company in Norwell, will deliver that night. Mini cream puffs, red velvet whoopie pies with cream cheese frosting, and coconut macaroons (all using from-scratch family recipes with no preservatives) are on the menu. Also on the menu are homemade pistachio bacon chocolate bark, sea salt caramels, and chocolate-dipped strawberries (weather permitting). Another attraction will be specially decorated large cookies in the shape of a book that will say “LOVE” on sale to support the library. In one of these cookie bags will be a gift certificate for a deluxe one-night stay at the Colonnade Hotel in Boston. In another bag will be a gift certificate to Hilliards, a South Shore confections favorite. Local artists have created works on the themes of love and sweets. These small and “reasonably priced” paintings will be available for purchase. Chapin emphasized that the evening is not for couples only. “Bring your book club, bring your mom, bring your next-door neighbor — as long as you like dessert,” she said. Anne M. Steele can be reached at anne.steele@globe.com. Follow her on Twitter @AnneMarieSteele.